Roofs can come in many shapes and sizes. Sometimes I think architects spend most of their time just trying to make things difficult for us roofers. Steep roofs with lots of hips and valleys I can deal with; but onion domes, geodesic domes, and built in oceanwaves? Please have mercy on us. If you use DaVinci Slate or Shake as a steep slope roofing materials it at least makes things easier. 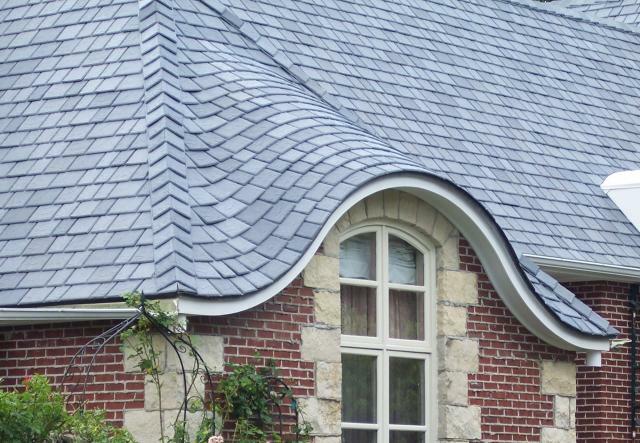 With DaVinci’s slate and shake products you can bend the tiles to make a radius and easily cut them when the roof plane calls for it. You can even nail the tiles almost anywhere if you need to. The photo below shows DaVinci polymer roof tiles on a roof eyebrow. As you can see the tiles can be molded and shaped to follow the surface of the roof deck.